...here, sat with HM The Queen. 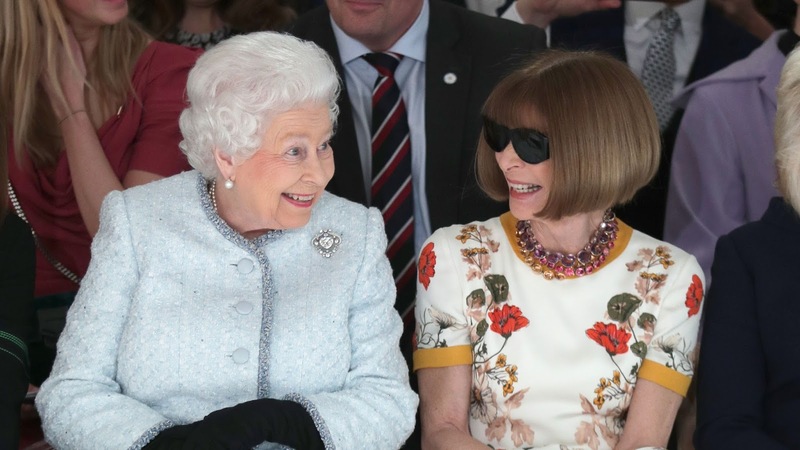 This unlikely pairing was in the front row of the London Fashion Week show by relative newcomer Richard Quinn [recipient of the inaugural Queen Elizabeth II award for British design; that's why HM was there]. Who's the one with the clashing necklace/dress/dark glasses? Prinny........who don't know who that is!?!?!?!?!?!? sees on Wintour's face is, don't talk to me, I've got an UTI. HM looks damn good for early 90s. wintour's face never changes...it must be a "face that she keeps in a jar by the door".